Speaker: Assoc Prof Dr Alvin Ng Lai Oon, D Psych. How to live with stress? Think about a flip response to this question: Just like how it is like to live with happiness. Life has both: stress and happiness, as well as many other feelings e.g. joy, anguish, anger, frustrations, jealousy, mirth, compassion, kindness, etc. It is often asked as though stress the only emotion that we don’t know how to live with, and that we expect some kind of unique and profound answer that only professionals and experts know about but we don’t. The purpose of this talk is to normalise stress, and other emotions as well as to provide a better understanding of emotional management with regards to daily functioning. One of the main tricks is to look beyond the labels of stress and problems as they are way too general to help you figure things out. When your target is too vague or general, you will tend to get stuck and overwhelmed. 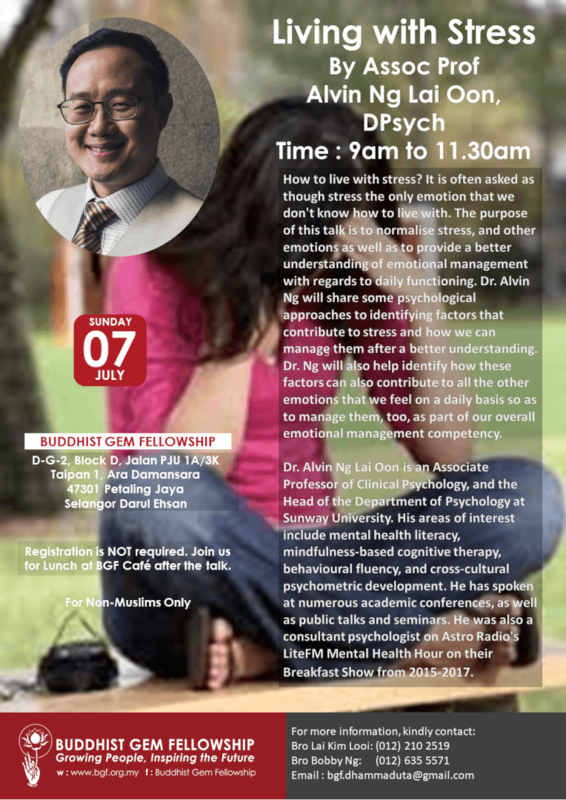 Dr. Alvin Ng will share some psychological approaches to identifying factors that contribute to stress and how we can manage them after a better understanding. Dr. Ng will also help identify how these factors can also contribute to all the other emotions that we feel on a daily basis so as to manage them, too, as part of our overall emotional management competency. In summary, you will learn a broader subject of how to live with emotions as a web of feelings, because you cannot deal with stress without dealing with other emotions as well. Dr. Alvin Ng Lai Oon is an Associate Professor of Clinical Psychology, and the Head of the Department of Psychology at Sunway University. He qualified as a clinical psychologist from Murdoch University, Western Australia. He was also conferred two prior basic degrees in psychology from Murdoch University and the University of Western Australia. Dr. Ng has been in academia since 2002 when he was attached to Universiti Kebangsaan Malaysia, where he also ran the Master of Clinical Psychology Programme for 11 years before moving to Sunway University. He was also briefly, the Director of Shine Guidance Centre, where he oversaw daily management of the centre as well as a clinical consultant for families living with developmental disabilities. Dr. Ng’s areas of interest include mental health literacy, mindfulness-based cognitive therapy, behavioural fluency, and cross-cultural psychometric development. He has spoken at numerous academic conferences, as well as public talks and seminars. He was also a consultant psychologist on Astro Radio’s LiteFM Mental Health Hour on their Breakfast Show from 2015-2017.